Desktop application that you can install on your Windows PC or laptop. Supports RFID, Barcode or name lookup to authenticate attendees. Allows you to TAG attendees and invite to events. Generate reports or export data to Excel. Uses Microsoft SQL Server Express as DB back-end. 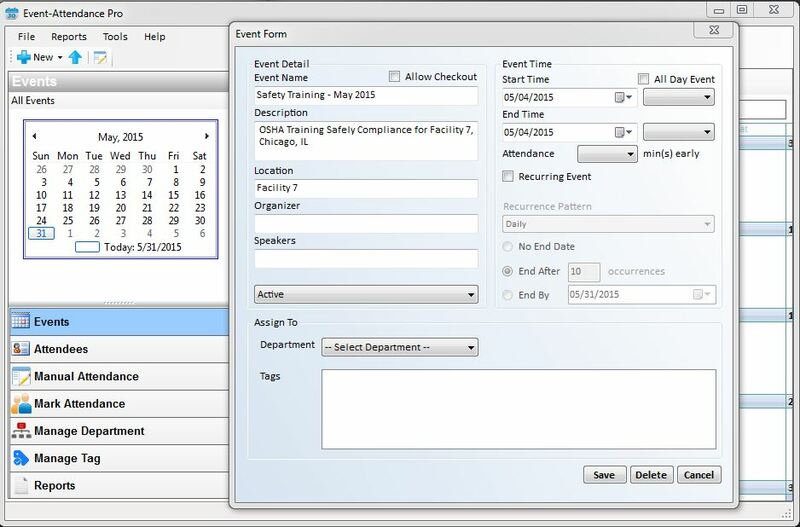 Event-Attendance Pro is designed to work with RFID badges or Barcode IDs to track attendance. Leverage your existing RFID badges, or your barcode IDs. Attending your event is as easy as opening a door. 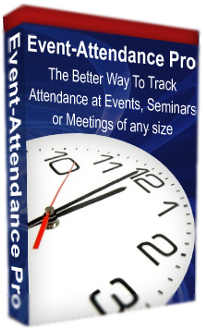 Event attendance tracking has never been simpler. No more sign in sheets with unreadable names or manual tracking. Now all an attendee needs to do simply touch his badge to an RFID reader or scan with a Barcode scanner, and a time stamped record of his attendance is logged. 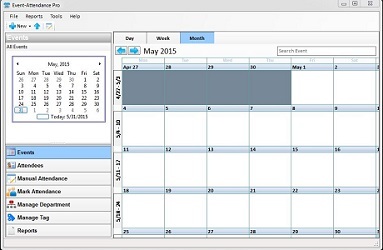 Using the calendar feature, the software allows you to create unlimited number of events. Create a one-time, all-day or even a recurring event. You can also assign an event to a particular department or tag(s). While you can enter attendee information manually, Event-Attendance Pro has the added convenience of uploading data in easy simple steps. Extract information from your existing USER/EMPLOYEE/ATTENDEE Database, format it to a comma-delimited file, and simply upload the file to the software. You can segment your attendees by department on upload or assign them to tag(s). 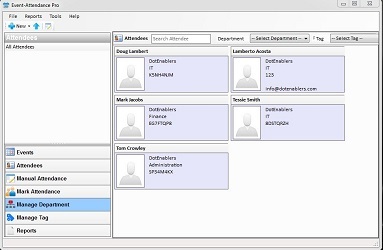 This essentially provides you the ability to assign events to particular departments or tags within your organization, which then allows you to capture who attended and who did NOT. It is easy to generate reports with Event-Attendance Pro. Select a report, provide dates criteria, and then run! 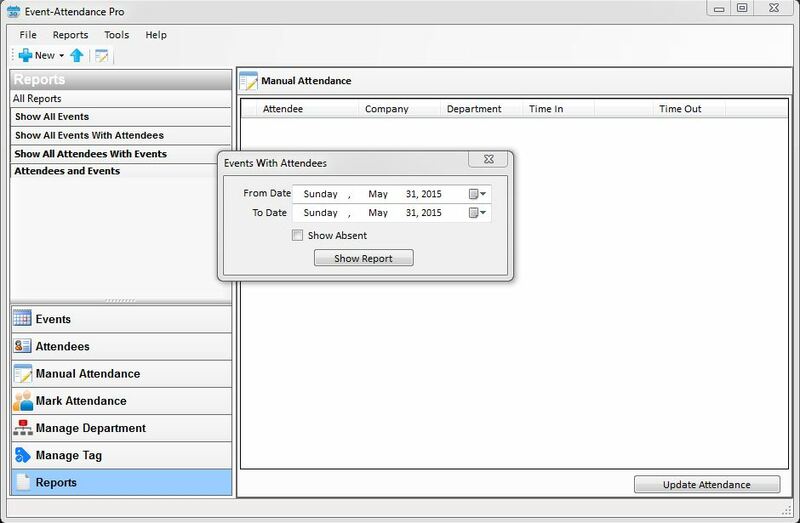 Event-Attendance Pro comes with four basic reports: All Events, Events With Attendees, Attendees With Events, and Attendees and Events. You can also generate a report to include who did NOT attend.